Talk about a sensational wine treat on a hot summers day. This was my sentiment upon first sip. 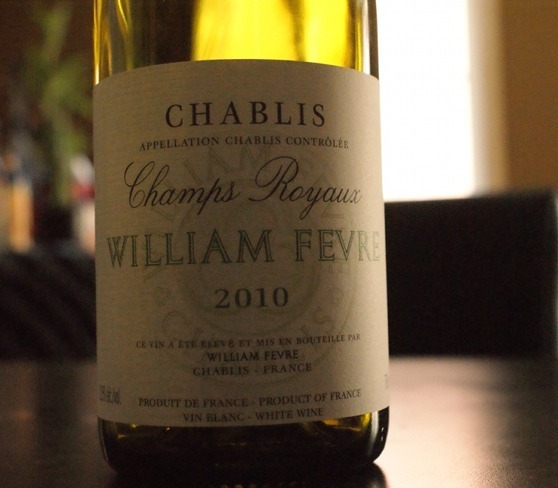 William Fevre is one of a group of wine makers that I am fond of, because regardless of the how many of his wines I try, I am never disappointed, and the same can be said for this Chablis. The Champs Royaux Chablis is made 100% from the chardonnay grape. It is golden in colour, with decidedly decent legs. On the nose, you’ll pick up a strong green-apple scent and hints of citrus and pear. On the palate, you’ll notice that this wine is dry, crisp, low to moderately sweet (sugar count of only 4), with a formidably managed acidity level. You’ll taste fresh green grapes, lemon and honey. It truly makes for a delightful wine. This wine is extremely easy drinking and can be had on its own, no pairing necessary. It is also ideal to bring as a hostess gift to the next summer BBQ or patio hang out that you’re invited to.